Display simulator vital signs on a real patient monitor using the VitalsBridge. Use real patient fetal and maternal monitors in your OB simulations. Enable learners to interpret vital signs using the same patient monitors used in their clinical practice. 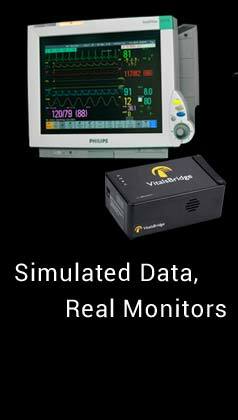 The VitalsBridge is the new standard for pairing simulation manikins and real patient monitors. 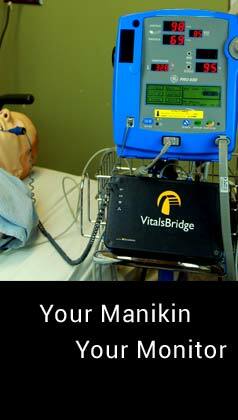 Use the VitalsBridge with any manikin or any standardized patient. The VitalsBridge can help add equipment fault algorithms to simulations. A typical medical simulation includes a sophisticated manikin, doll, or actor connected to a computer screen that displays simulated vital signs. This gives clinicians-in-training an opportunity to diagnose and "treat" the manikin appropriately based on the data displayed on the screen. However, the computer display of vital signs does not give an accurate representation of a real-world scenario because it lacks the authenticity of an actual patient monitor. These monitors range from basic displays for a nursing station to highly complex ICU monitors with interactive menus that require significant training. The typical clinician training in a traditional simulation lab does not have the opportunity to learn and practice using these ICU monitors before actually working with real patients. 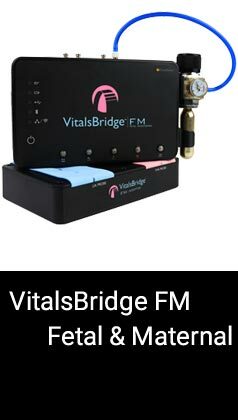 The VitalsBridge is a simple product that links your simulated patient (low- or high-fidelity manikins or standardized patients) with any modern patient monitor, including those manufactured by Philips, GE, Covidien Medtronic, Spacelabs, Welch Allyn, Zoll, and many more. This means your simulated data can now be displayed on the same monitors that clinicians will use daily in the workplace. Utilizing the VitalsBridge in your simulation lab will enable clinicians to leave fully trained on the very equipment they will use in their clinical setting. The VitalsBridge now comes in four different models, including the VitalsBridge FM for fetal and maternal simulations. Select the one that best meets your simulation needs. You'll be surprised how easy it is to utilize real patient monitors with your simulation manikins and standardized patients. We are only an e-mail or phone call away.